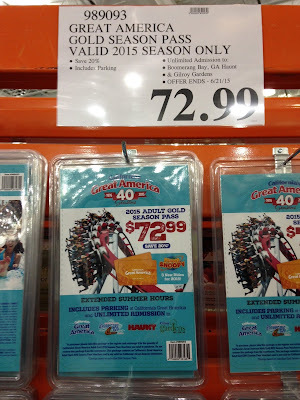 I love going to theme parks, and I think this deal for a 2015 gold season pass to California's Great America is probably one of the best deals at Costco. If you enjoy riding roller coasters, then this is for you. I went to Great America last summer and an adult ticket for admission was like $40 with a coupon. With a season pass, it'll start paying for itself after just 2 visits. In addition to unlimited admission, parking is also free if you have a season pass which makes it all the more worth it. This season pass is a lot more expensive compared to last year's season pass from Costco in 2014, but you'll still save 20% if you get this at Costco as opposed to buying it at the park. So act now because they'll only carry this until the end of June or until they run out, but you can expect these to start selling out once the kids start getting out of school by end of May to early June. Once these are all gone, Costco will just switch to selling single day admission passes to Great America amusement park which would still be at a discount as opposed to just buying it at the park. The gold season pass from Costco is a huge savings if you and your family plan on going to Great America a lot in the Summer to ride Demon, Flight Deck, Vortex, Drop Tower, Rip Roaring Rapids, etc., so get your pass now and be prepared for the upcoming summer fun (Great America should be open a few days during Spring Break also). This even gives you unlimited access to Great America's Halloween Haunt as well. 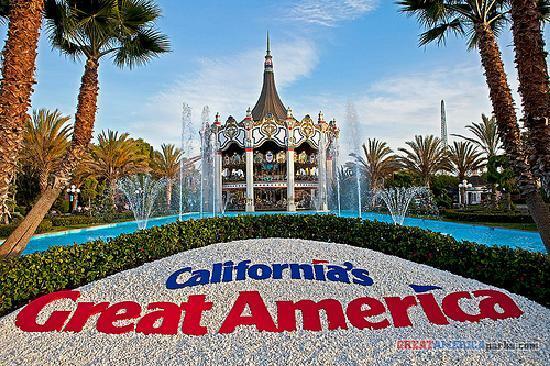 Save money with a 2015 Adult Gold Season Pass to California's Great America. Rides and attractions include Grizzly, Rip Roaring Rapids, Drop Tower, Flight Deck, Gold Striker, Demon, HMB Endeavor, Delirium, FireFall, Vortex, Logger's Run, Boomerang Bay, and many more! 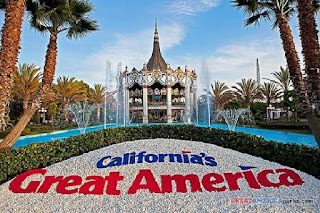 Realize that if you're buying the pass for Gilroy Gardens, you still have to go to Great America first to process the tickets to get a Gold Card. The processing center is in the park, and during the Memorial Day weekend, the wait time was about an hour. Hi @Anonymous, thank you for letting us know that you must go to Great America first to process your season pass before going to Gilroy Gardens. I guess this detail often times gets overlooked since most people don't intend to go to Gilroy Gardens anymore, but this information is definitely useful for those who plan to visit Gilroy Gardens with the Great America Gold Season Pass. Thanks again! 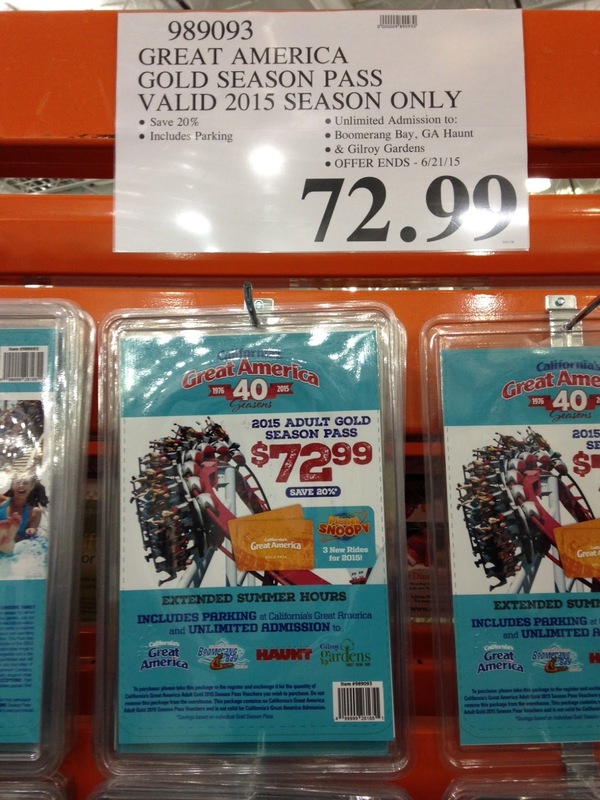 Do you know how much Costco is selling single day admission passes to Great America amusement park? Hello @Anonymous, actually I haven't seen single day admission tickets to Great America at Costco this year. I thought I saw some last year and thought there would be some this year, but I'm beginning to doubt myself on that. It probably was a season pass that I saw last year instead of single day tickets. I actually know someone who works for the city of LA, and he gets single day tickets (with no blackout dates) to Great America for $35 plus a fee which is a pretty good deal. If you know someone who works for a local government, maybe he/she can get you some discounted tickets to Great America. Hi @Anonymous, this is an update to your question regarding single day tickets to California's Great America. I finally saw 2015 single day admission tickets to Great America at the Costco in Foster City, CA and I posted here. I hope this helps! Enter Promo Code: "uniondays2" in Promo Code box located in upper right hand corner. $31 tickets till September 7th. Hi s @Big Al. That's definitely one of the better deals for a single day ticket to California's Great America. With the summer winding down and the school year starting for many kids, it's great that prices are going down. People wanting to go to Great America one last time before summer ends will find this deal quite helpful. Thank you for posting! Is the Gold Pass for one person or two? Just wondering... thanks in advance! Hi @Anonymous, the Great America Gold Season Pass is only for one person.